I am so excited for the start of 2016!!!! This past 2015 year has been full of many unfortunate events and terrible luck, so you can understand my enthusiasm of starting from scratch in 2016. 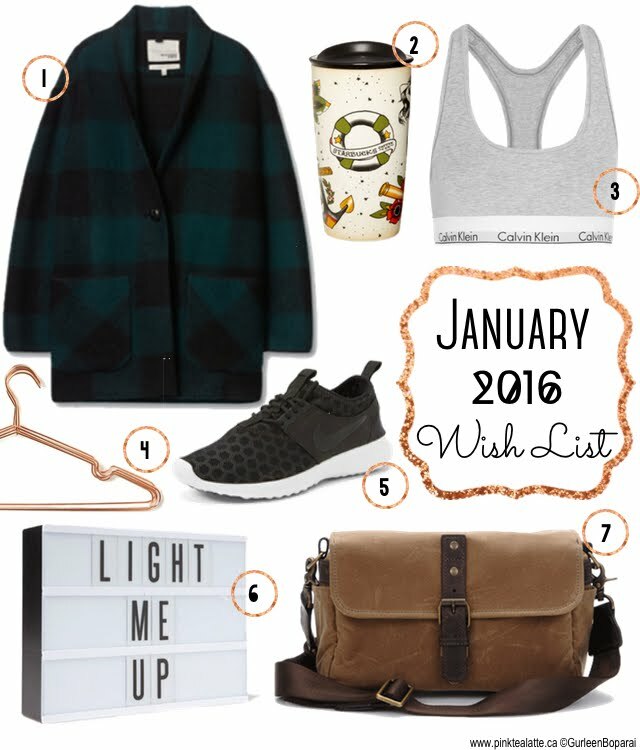 And what better way to start off the New Year, but with a wish list! Hehe For the most part, I am quite content and do not have many wants or needs. Or perhaps its just me still trying to recover from laryngitis is making me feel blah and not interested in anything new. Regardless, I came up with some fun things I would love to have! I have started taking photography more seriously and have even invested in a new lens, the 50mm Nikkor Lens, and I think it is time I got a legitimate camera bag. Ona makes camera bags that are not only going to protect my camera and lens' from the weather and bumps, their bags have a hipster charm and are made from quality materials. I also went to get back in the habit of working out consistently at the gym. Perhaps as a little motivation, some new workout gear will do the trick? Okay, the Calvein Klein Racerback may not have the best support, but I will feel awesome wearing it! And some new Nikes because Nikes are awesome. Every time I visited Aritzia over the past couple of months, I am drawn to this plaid coat. It is such a beautiful jewel tone and the plaid just makes it unique and timeless. I am really really really wanting it, but it comes with a bit of a price tag :( we shall see if we are meant to be! Also, the copper wired hangers really just speak to me. My clothing need to be hung on those beautiful hangers. Lately, I have been seeing word light boxes popping up in everyone's instagram feeds. I want one TOOO! They are so cool! It is an extremely versatile all year round item because you can simply change the words/phrase when you feel like it. Plus, it reminds me of the movie theatres when they would have the movie titles spelt out front. Brings me back to my childhood! Lastly, as I am a loyal gold card Starbucks lover, it only makes sense I would want a double walled ceramic tumbler. They come in so many fun different colours and patterns, but this vintage tattoo one is what really caught my eye. It is just so different and unexpected! Kind of just stuck out like a sore thumb against the wall of tumblers. And standing out in a crowd is NOT a bad thing! Who wants to blend in? Not me! I just think it is super cute and nothing beats a tatted up tumbler. Let me know in the comments below what is on your 2016 January Wish List and if any of items on my list caught your eye!